Feature Finish, 30 Laps: 1. Cory Eliason; 2. Danny Dietrich; 3. Brock Zearfoss; 4. Cale Conley; 5. 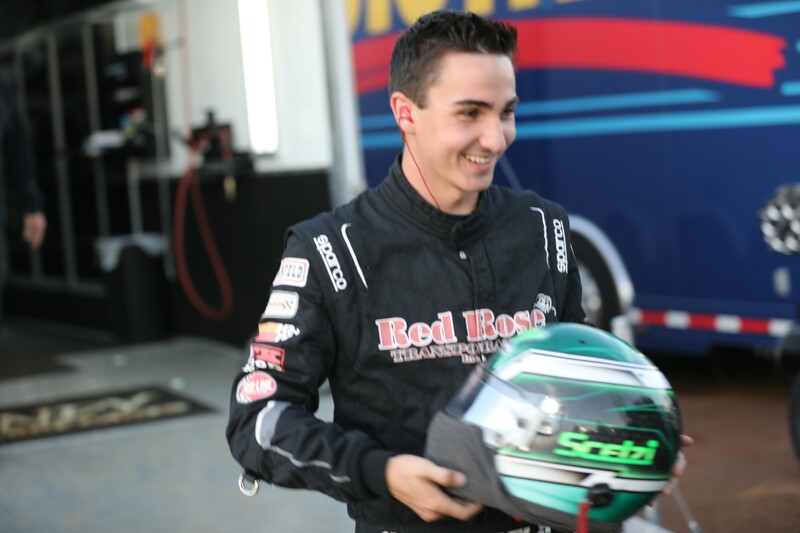 Aaron Reutzel; 6. Tony Stewart; 7. Paul McMahan; 8. Gerard McIntyre Jr.; 9. Lucas Wolfe; 10. Spencer Bayston; 11. Skylar Gee; 12. Ryan Smith; 13. Greg Wilson; 14. Tyler Esh; 15. Dale Blaney; 16. Mallie Shuster; 17. Tim Shaffer; 18. David Quackenbush; 19. George Hobaugh; 20. Anthony Fiore; 21. Dylan Cisney; 22. Dave Blaney; 23. Rick Elliot; 24. Dalton Dietrich. 410 Sprint Feature Finish, 30 Laps: 1. Byron Reed; 2. Buddy Kofoid; 3. Ryan Ruhl; 4. Parker Price-Miller; 5. Brian Lay; 6. Max Stambaugh; 7. Cap Henry; 8. T.J. Michael; 9. Travis Philo; 10. D.J. Foos; 11. Nate Dussel; 12. Trey Jacobs; 13. Stuart Brubaker; 14. Chris Andrews; 15. Ricky Peterson; 16. Caleb Griffith; 17. Jack Sodeman; 18. Cale Thomas; 19. Broc Martin; 20. Trevor Baker. 305 Sprint Feature Finish, 25 Laps: 1. John Ivy; 2. Paul Weaver; 3. Jamie Miller; 4. Luke Griffith; 5. Mike Burkin; 6. Seth Schneider; 7. Brandon Moore; 8. Tyler Street; 9. Kyle Peters; 10. Bobby Clark; 11. Kyle Capodice; 12. Shawn Valenti; 13. Justin Adams; 14. Jason Keckler; 15. Mike Moore; 16. Jerry Dahms; 17. Jimmy McGrath Jr.; 18. Steve Rando; 19. Zeth Sabo; 20. Larry Kingseed Jr.; 21. Kevin Mingus; 22. Mike Grigsby. Feature Finish: 1. Jeff Swindell; 2. Joe B. Miller; 3. Cory Bruns; 4. Jeremy Standridge; 5. Kyle Schuett; 6. Jason Keith; 7. Steve Short; 8. Brayton Lynch; 9. Christopher King; 10. Joey Moughan; 11. George Crawford; 12. Robbie Standridge; 13. Aidan Roosevans; 14. Brayden Fox; 15. Brinton Marvel; 16. Paul Nienhiser. Feature Finish, 30 Laps: 1. Chase Johnson; 2. Colby Johnson; 3. Jake Haulot; 4. Kaleb Montgomery; 5. Jeremy Chisum. Feature Finish, 30 Laps: 1. Giovanni Scelzi; 2. Mitchell Faccinto; 3. Shane Golobic; 4. Tim Kaeding; 5. Rico Abreu; 6. Kyle Hirst; 7. Bud Kaeding; 8. Tony Gualda; 9. D.J. Netto; 10. Ryan Robinson; 11. Jason Statler; 12. Tanner Carrick; 13. Justin Sanders; 14. Nathan Rolfe; 15. Geoff Ensign; 16. Cole Macedo; 17. Blake Carrick; 18. Sean Becker; 19. Kyle Offill; 20. Colby Copeland; 21. Justyn Cox; 22. Andy Forsberg; 23. Willie Croft; 24. Garen Linder. Feature Finish, 25 Laps: 1. Mark Smith; 2. Johnny Bridges; 3. Tyler Clem; 4. Dale Howard; 5. Terry Gray; 6. Danny Smith; 7. Nick Snyder; 8. Mark Ruel Jr.; 9. Matt Kurtz; 10. Johnny Gilbertson; 11. Tony Agin; 12. Terry Witherspoon; 13. Jake Karklin; 14. Danny Martin Jr.; 15. Joe Larkin; 16. Tanner Witherspoon; 17. Jeff Willingham; 18. Connor Leoffler; 19. Hayden Campbell; 20. Bob Auld. Feature Finish, 30 Laps: 1. Brady Bacon; 2. Kevin Thomas Jr.; 3. Jason McDougal; 4. Tyler Courtney; 5. C.J. Leary; 6. Justin Grant; 7. Chad Boespflug; 8. Chase Stockon; 9. Chris Windom; 10. Robert Ballou; 11. Jordan Kinser; 12. Josh Hodges; 13. Dakota Jackson; 14. Carson Short; 15. Dave Darland; 16. Isaac Chapple; 17. Stephen Schnapf; 18. Joe Stornetta Jr.; 19. Lee Underwood; 20. TJ Artz; 21. Dustin Christie; 22. Zach Daum. Feature Finish, 25 Laps: 1. Logan Schuchart; 2. Daryn Pittman; 3. Jacob Allen; 4. Kraig Kinser; 5. Donny Schatz; 6. Brad Sweet; 7. Carson Macedo; 8. Travis Rilat; 9. David Gravel; 10. Shane Stewart; 11. Kerry Madsen; 12. Ian Madsen; 13. Brent Marks; 14. Sammy Swindell; 15. Chad Kemenah; 16. Jason Sides; 17. Scott Bogucki; 18. Danny Wood; 19. Mason Daniel; 20. Dalton Stevens; 21. Tony Bruce Jr.; 22. Wayne Johnson; 23. Sheldon Haudenschild; 24. Sam Hafertepe Jr.
WILLIAMS GROVE SPEEDWAY (All Star Circuit of Champions): ppd. to Sept. 20. 410 Sprint Car Feature Finish, 30 Laps: 1. Cap Henry; 2. Lee Jacobs; 3. Justin Peck; 4. Parker Price-Miller; 5. Nate Dussel; 6. Brian Smith; 7. Hunter Schuerenberg; 8. Buddy Kofoid; 9. Brian Lay; 10. D.J. Foos; 11. Byron Reed; 12. Chris Andrews; 13. Ryan Broughton; 14. Caleb Griffith; 15. Stuart Brubaker; 16. Kelsey Ivy; 17. Chad Wilson; 18. Brandon Wimmer; 19. Max Stambaugh; 20. Broc Martin. 410 Sprint Car Feature Finish, 25 Laps: 1. Alan Krimes; 2. Adam Wilt; 3. Brian Montieth; 4. Chase Dietz; 5. Brett Michalski; 6. Brandon Rahmer; 7. Kyle Moody; 8. Jim Siegel; 9. Chad Trout; 10. Dan Shetler; 11. Tim Glatfelter; 12. Glenndon Forsythe; 13. Landon Myers; 14. Jordan Givler; 15. Bradley Howard; 16. Scott Fisher; 17. Jay Galloway; 18. Brent Shearer; 19. Colton Young; 20. Shai Morris; 21. Brie Hershey; 22. Joe Kata III; 23. Ryan Linder. 358 Sprint Car Feature Finish, 20 Laps: 1. Doug Hammaker; 2. Kenny Kuhn; 3. Austin Treuchet; 4. Tyler Ross; 5. Alyson Dietz; 6. Jeff Halligan; 7. Chris Frank; 8. Cody Fletcher; 9. Glenndon Forsythe; 10.Travis Scott; 11. Kyle Denmyer; 12. Dylan Norris; 13. Matt Findley; 14. David Holbrook; 15. Ashley Cappetta; 16. Zachary Cool; 17. D.J. Montgomery; 18. Zachary Allman; 19. Troy Wagaman Jr.; 20. John Sharpe; 21. Tyler Walton; 22. Mark VanHorst; 23. Wyatt Hinkle; 24. Brett Strickler. Feature Finish, 25 Laps: 1. Jason Shultz; 2. Davie Franek; 3. Ryan Kissinger; 4. Cody Keller; 5. Adam Carberry; 6. Chad Layton; 7. Kyle Reinhardt; 8. Chad Miller; 9. Jake Hummel; 10. Ryan Stillwaggon; 11. Derek Locke; 12. Michael Walter II; 13. Jimmy Stitzel; 14. Colby Womer; 15. Thomas Radivoy. Feature Finish, 30 Laps: 1. Giovanni Scelzi; 2. Tim Kaeding; 3. Kyle Hirst; 4. Colby Copeland; 5. Tony Gualda; 6. Bud Kaeding; 7. Ryan Bernal; 8. Shane Golobic; 9. Rico Abreu; 10. Justyn Cox; 11. Willie Croft; 12. Justin Sanders; 13. Logan Seavey; 14. Kalib Henry; 15. Cole Macedo; 16. Lucas Ashe; 17. Mitchell Faccinto; 18. Sean Becker; 19. Kyle Offill; 20. Tucker Worth; 21. Garen Linder; 22. D.J. Netto; 23. Andy Forsberg; 24. Cody Lamar. Feature Finish: 1. Mark Smith. Feature Finish, 25 Laps: 1. Danny Mumaw; 2. Sye Lynch; 3. Trey Jacobs; 4. Brandon Matus; 5. Brandon Spithaler; 6. Jordan Ryan; 7. Clay Riney; 8. Trevor Baker; 9. Dean Jacobs; 10. Jack Sodeman Jr.; 11. Jordan Harble; 12. Jess Stiger; 13. Josh Davis; 14. Tyler Dunn; 15. Troy Kingan; 16. Dylan Kingan; 17. Nick Patterson; 18. Andy Fike; 19. Steve Butler; 20. Henry Malcuit. WORLD OF OUTLAWS (Devil’s Bowl Speedway): Rain. UNITED STATES AUTO CLUB (Tri-State Speedway): ppd. June 30th.